We are pleased to introduce our self, Invogue Building Systems Pvt Ltd reckoned in the market as a manufacturer and supplier of Pre-Engineered Building. We are pleased to introduce our self, Invogue Building Systems Pvt Ltd reckoned in the market as a manufacturer and supplier of a Pre-engineered Building. The products offered by us encompass of Pre-engineered Building , Industrial Shed, Industrial Warehouse, Pre fabricated structure, Roofing/Cladding sheets, Pipe Portal Structure, Porta Cabins, Puf Panel, Prefabricated Houses, Prefabricated Homes, Prefabricated indoor Stadium, pipe structure, Multi Storey Building, Cold room Structure, Cold Storage Structure, Solar Mounting Structure, Car-Parking Structure, Fruit Ripening Chamber, Banana Ripening Chamber, Mango Ripening Chamber, Dairy Farm shed, Poultry Shed and False Ceiling Products. Our products are available in various grades and specifications as per the requirements of the customers. Moreover, these products are durable, efficient, have high strength, require low maintenance, and are high performing. Made from high grade raw materials, our products are assured for long functional life. We offer these products at the very competitive prices. 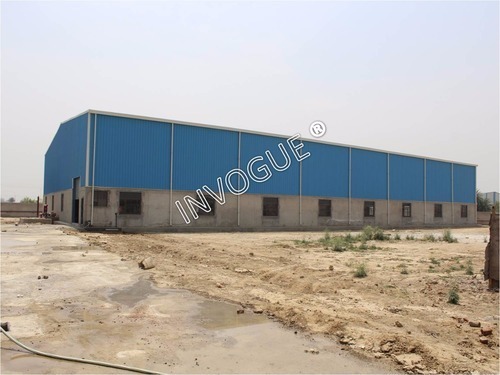 Invogue Building systems (P) Ltd certified company having corporate offices in New Delhi, and having a fully operational state of the art PEB manufacturing unit in Greater Noida.